At one point in my life I wanted to be an event planner. I love taking a simple idea or theme and developing it, taking care of all the little details, delegating tasks for others to do, and then seeing the end results all come together in a fantastic event that everyone loves. It is a lot of work, but totally worth it in the end, especially seeing your friends and family so happy! Since I have hosted and attended several bridal showers and housewarming parties over the years, I am always looking for new and creative gifts and decorating ideas. 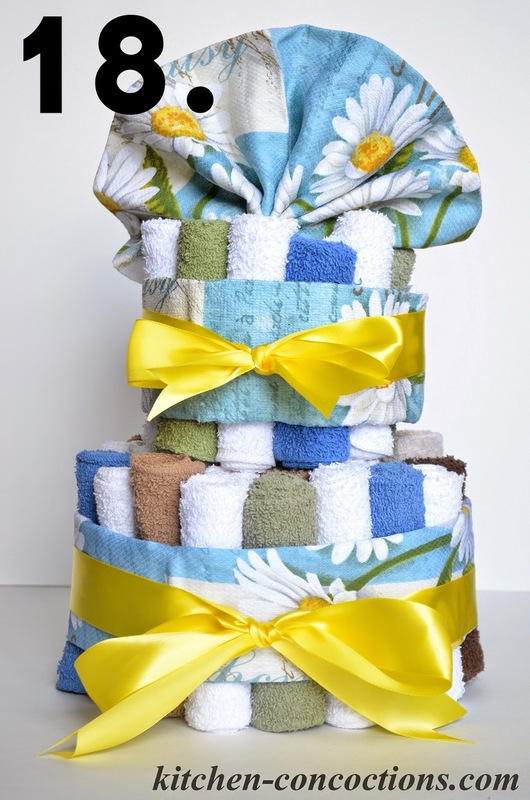 A dish towel ‘cake’ (similar to a diaper ‘cake’ found at many baby showers) has been an idea floating around in my head for awhile. This cake is a gift that would be great to help newlyweds or new home owners stock their kitchen. 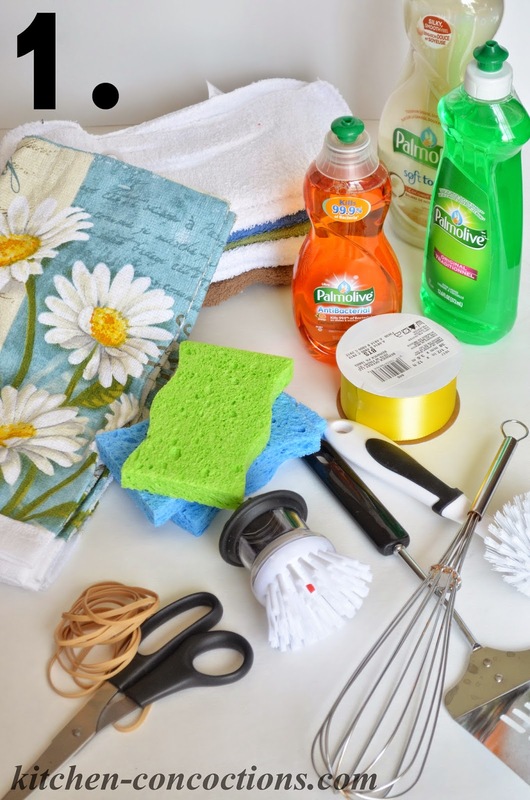 It takes common kitchen essentials, including different utensils and cleaning items, like Palmolive dish soap, and makes them look cute in creative packaging. 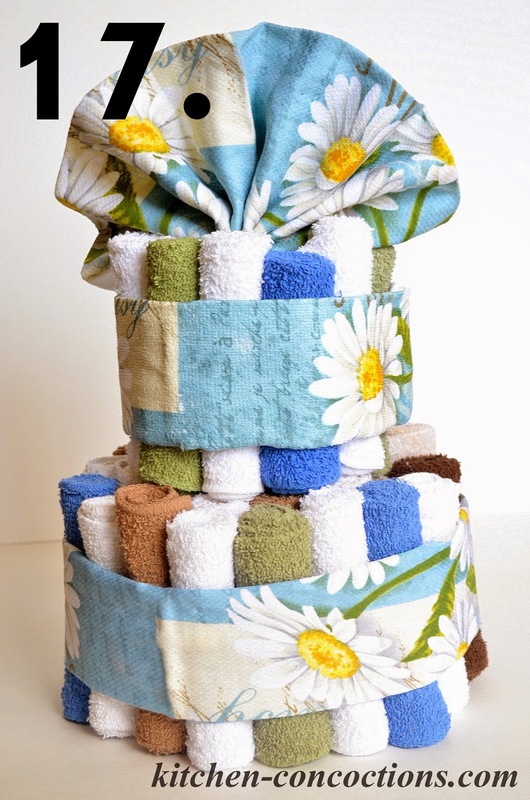 I recently had an opportunity to make my dish towel cake to take to some friends that just moved into their first house. Since this was a big event in their lives, I wanted to give them a gift that was memorable, useful, yet affordable for me. Since I was on a budget and needed a variety of items to make my dish towel cake a success, I headed to Walmart to gather all my supplies. 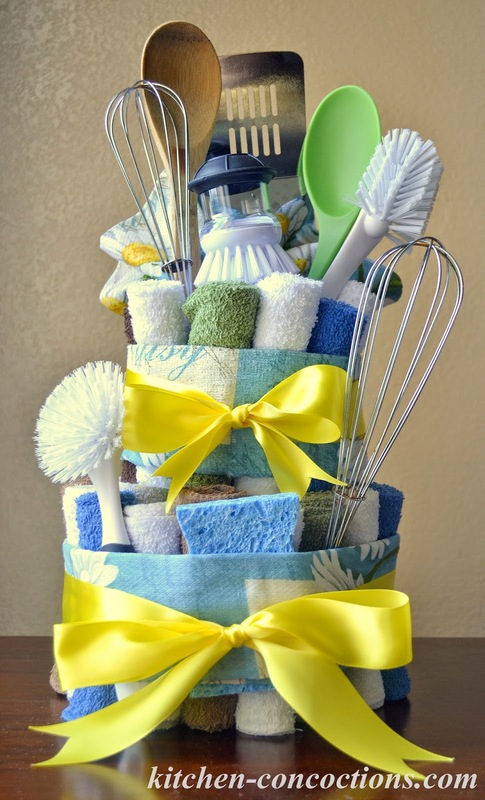 With the entire cake being made up of dishtowels, I knew I wanted a mix of kitchen utensils and cleaning supplies. I wanted every bit of the cake to be useful, so even the center base of the cake is a large bottle of Palmolive dish soap. 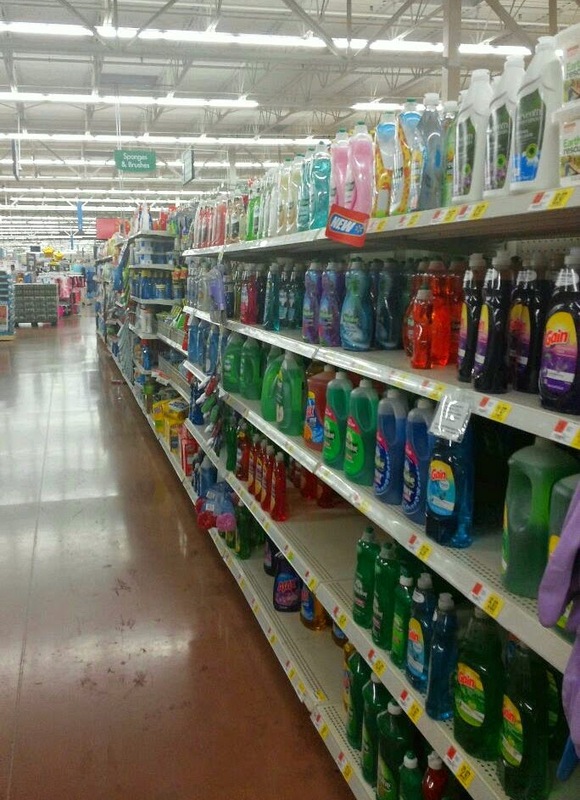 Palmolive is the brand dish soap my Mom always used, due to the fact it is tough on grease soft on hands. I like how a little goes a long way to clean a big pile of dirty dishes, which is common in my kitchen! 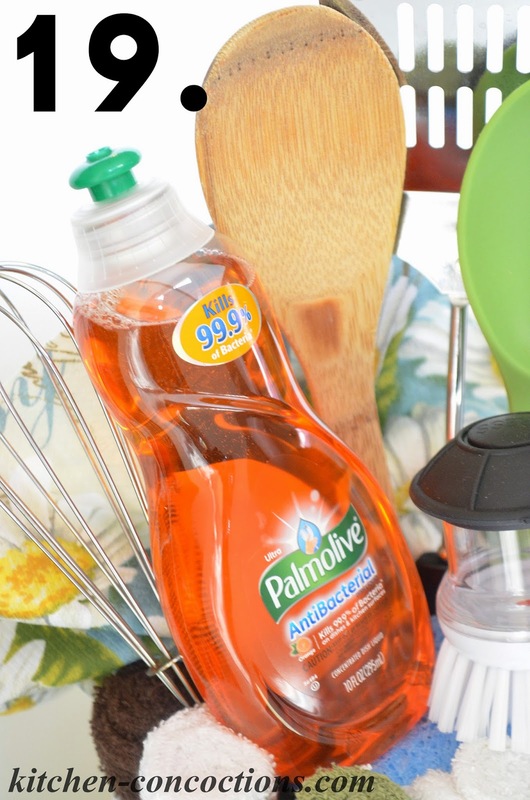 To put a little more fun into doing the dishes and to celebrate the many uses for dish soap, Palmolive is hosting a sweepstakes where you can enter to win a $2,000 Walmart gift card and other weekly prizes! The sweepstakes begins today, August 11, and you can click here for additional details and to enter. 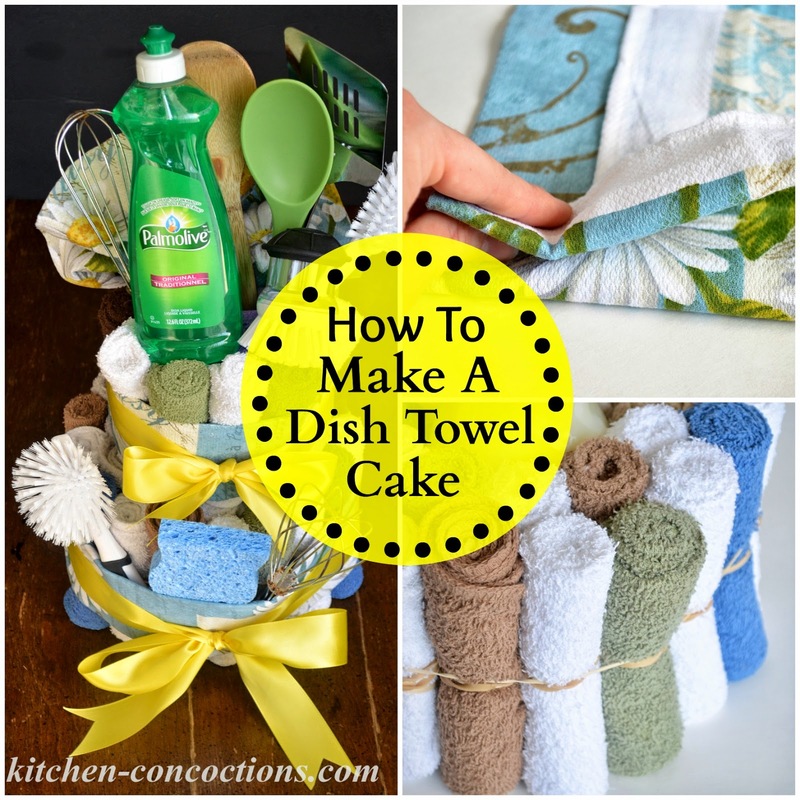 Since I like to get my craft on, and I know many of you need new and creative gift ideas too; today I am sharing a step-by-step tutorial on how to make a Dish Towel Cake. Check it out below! 2. 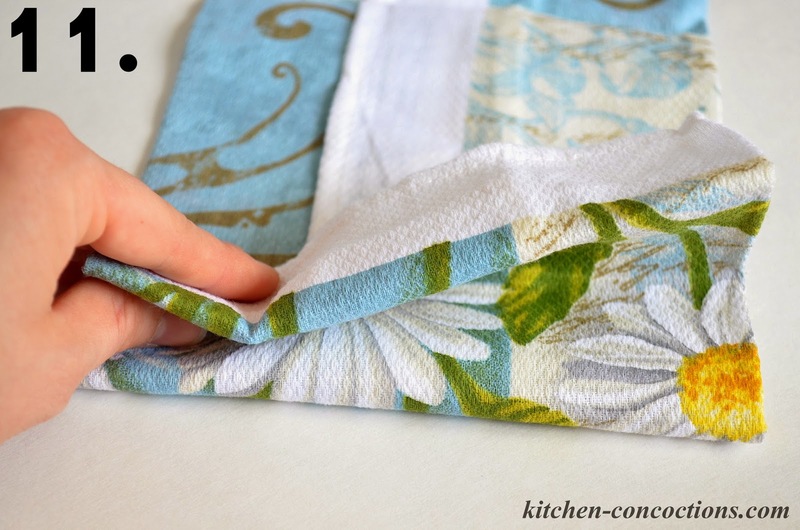 Fold square dish towels in half, to form rectangle, making sure tag is on the inside. 3. 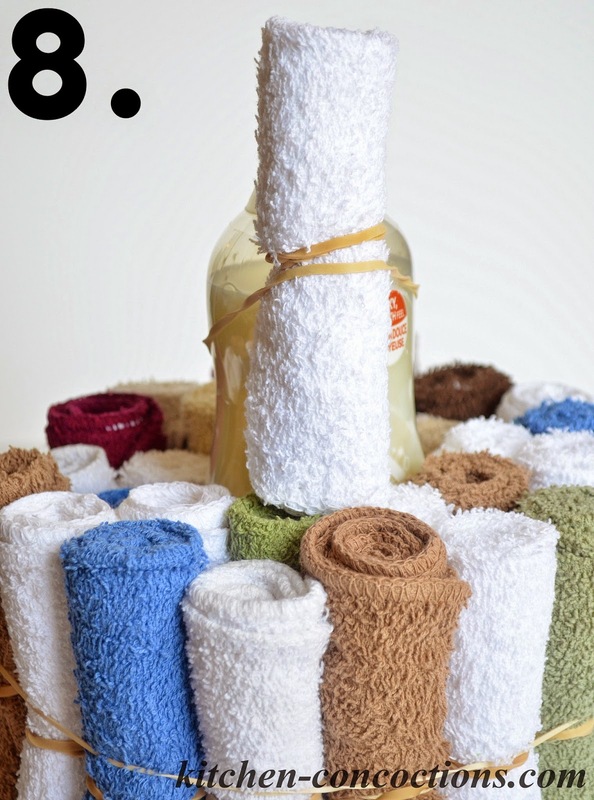 Starting at the bottom of the folded towel, tightly roll up the towel. 4. 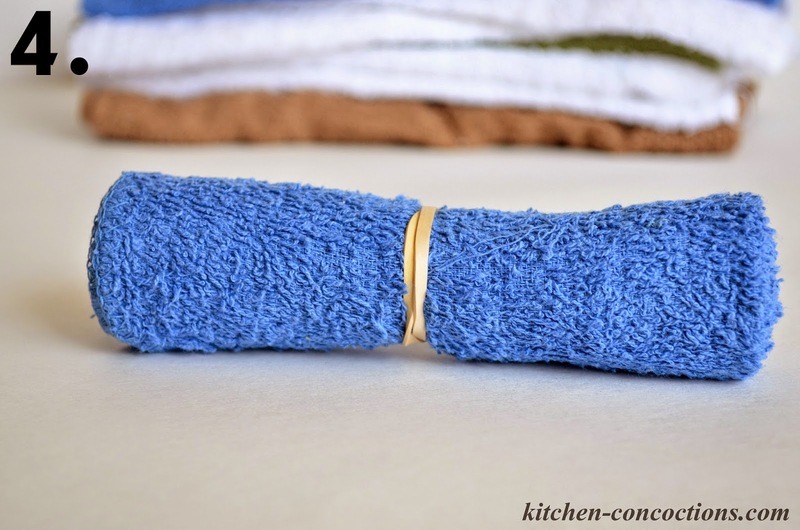 Wrap a rubber band around the center of the rolled up dish towel to secure. Repeat with remaining dish towels and set aside. 5. 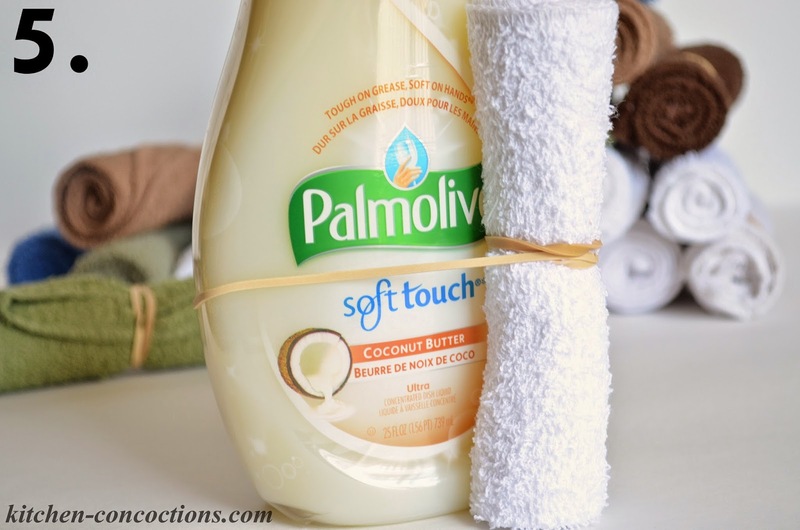 Place a rubber band around the bottom middle of the 25 ounce bottle of Palmolive Dish Soap. 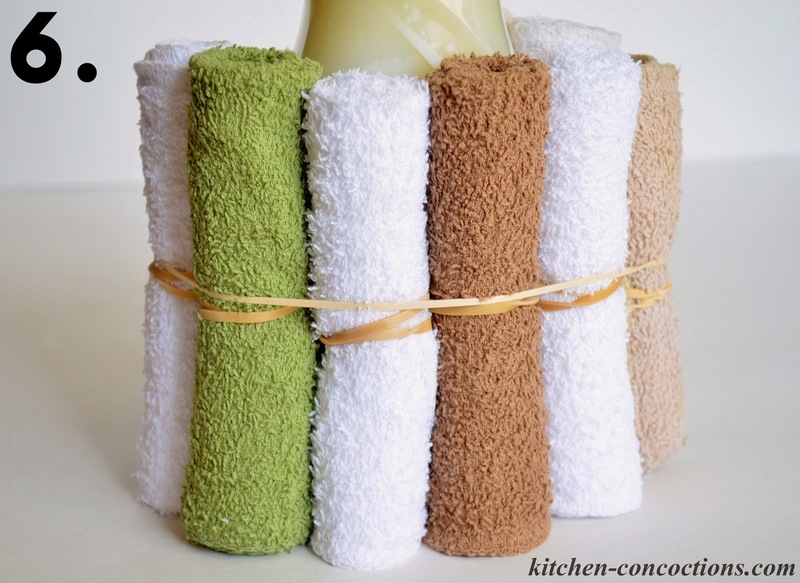 Insert one of the rolled up dish towels under the rubber band, securing it tightly next to the bottle of dish soap. 6. 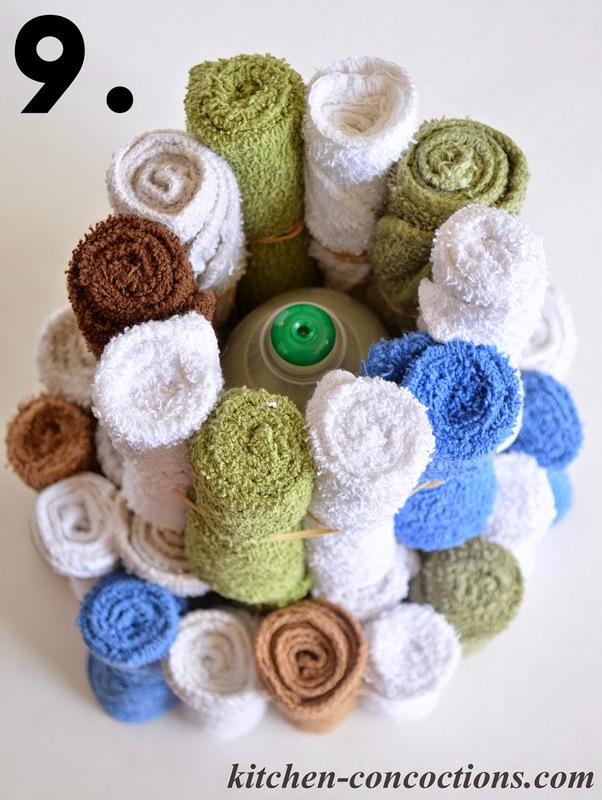 Repeat with approximately 10-11 dish towels, inserting the rolled up towels in desired color pattern, in a circular shape around the bottle of dish soap. 7. 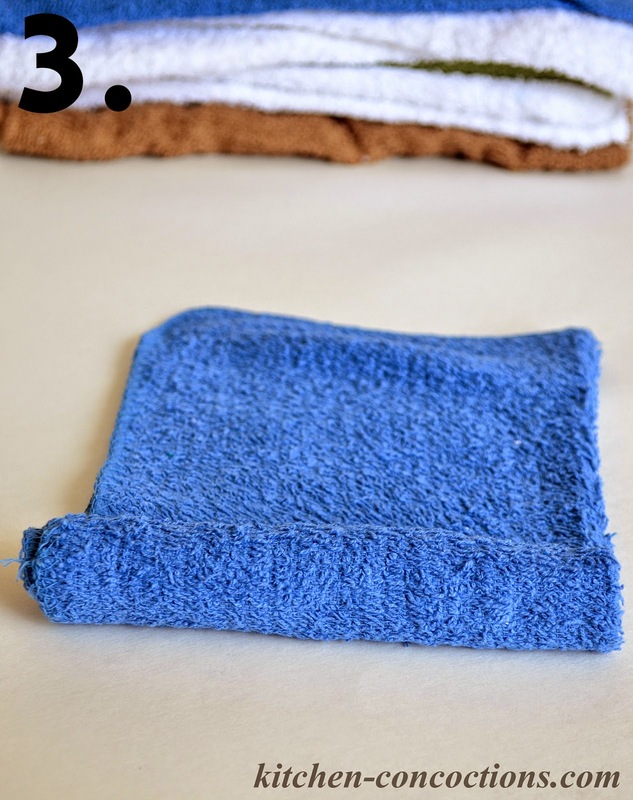 Form second layer of the bottom cake tier by inserting another row of towels under the rubber band, lining them up directly next to the first layer of towels. 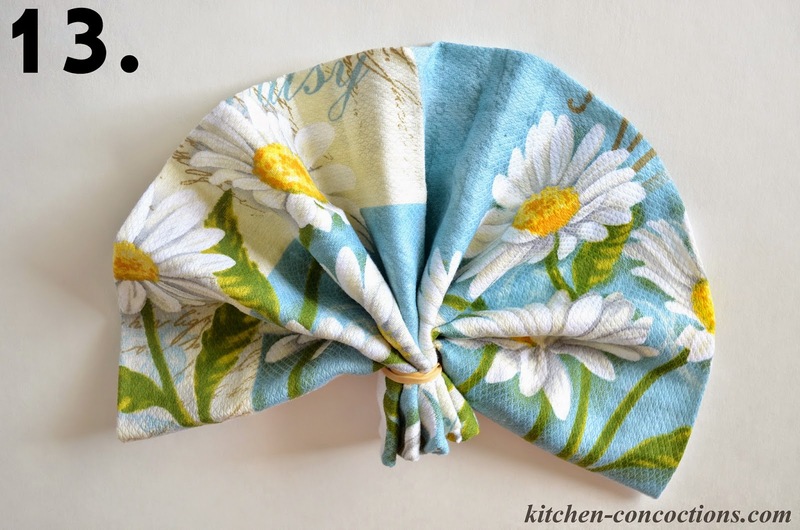 Dish towels should be in a circular shape around the first layer of dish towels. 8. 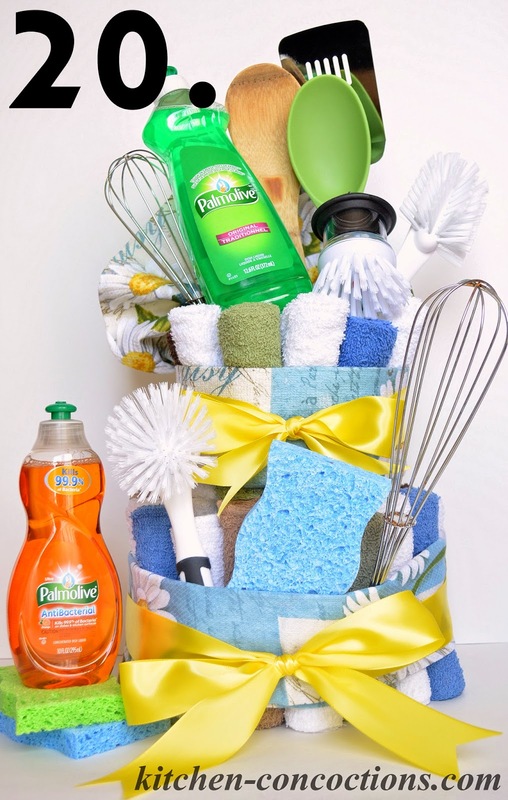 Place a rubber band around the top middle of the 25 ounce bottle of Palmolive Dish Soap. 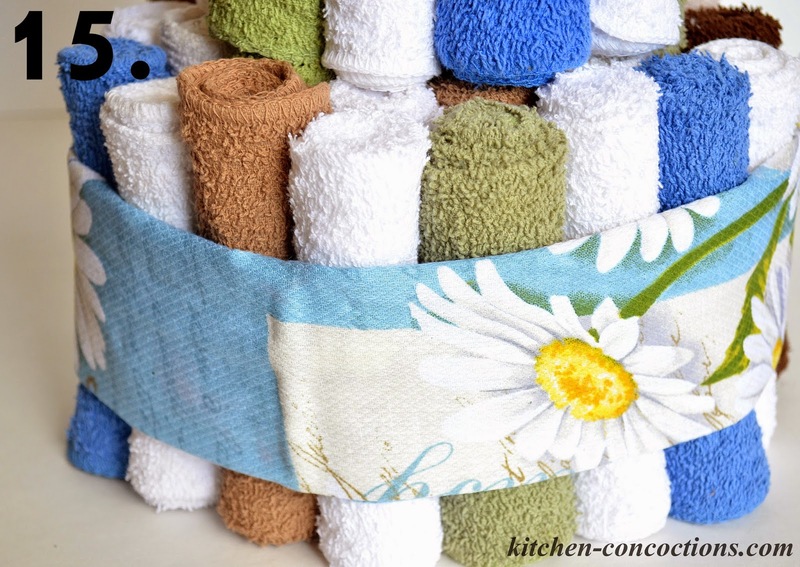 Insert one of the rolled up dish towels under the rubber band, securing it tightly next to the bottle of dish soap. 9. 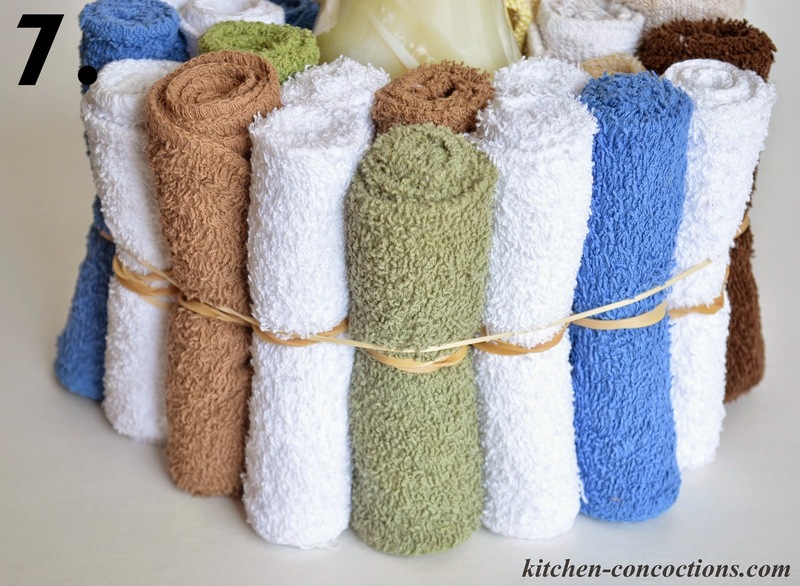 Repeat with approximately 9 dish towels, inserting the rolled up towels in desired color pattern, in a circular shape around the bottle of dish soap to form top tier. 10. To form cake topper, take one decorative kitchen towel and open towel lengthwise. Fold bottom end (about 1 inch) of kitchen towel over. 11. 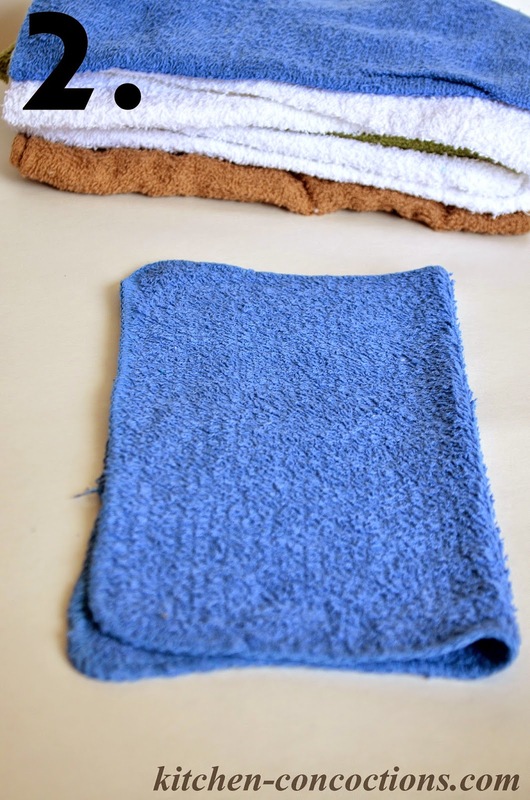 Next, fold the folded 1 inch piece of the towel back. 12. Repeat this process to form a fan shape. 13. 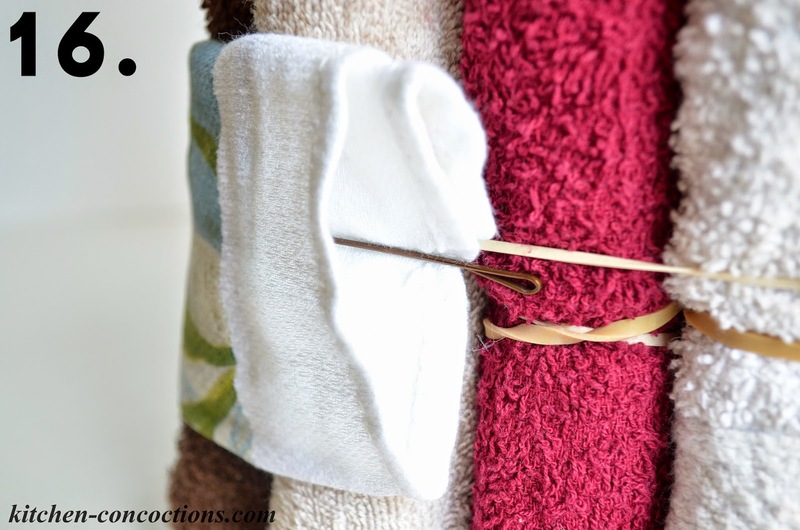 Secure the bottom of the towel fan with a rubber band to hold shape. 14. Insert towel fan into the top of the cake. 15. 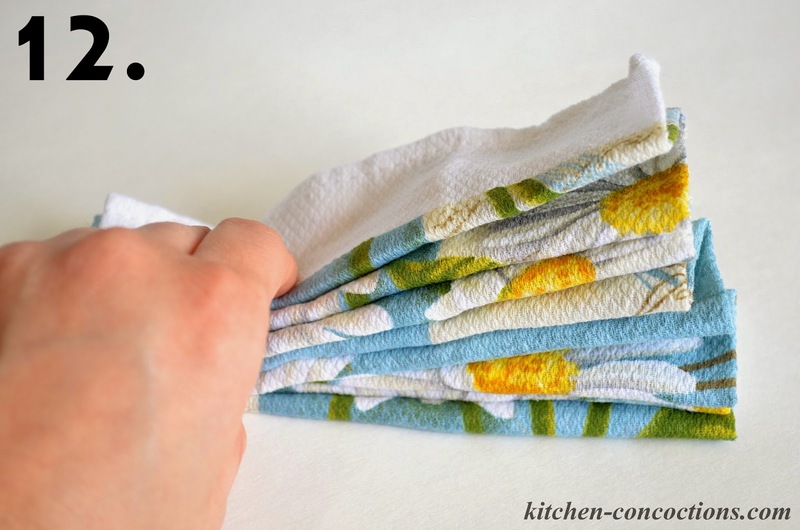 Take another decorative kitchen towel and fold it in half. 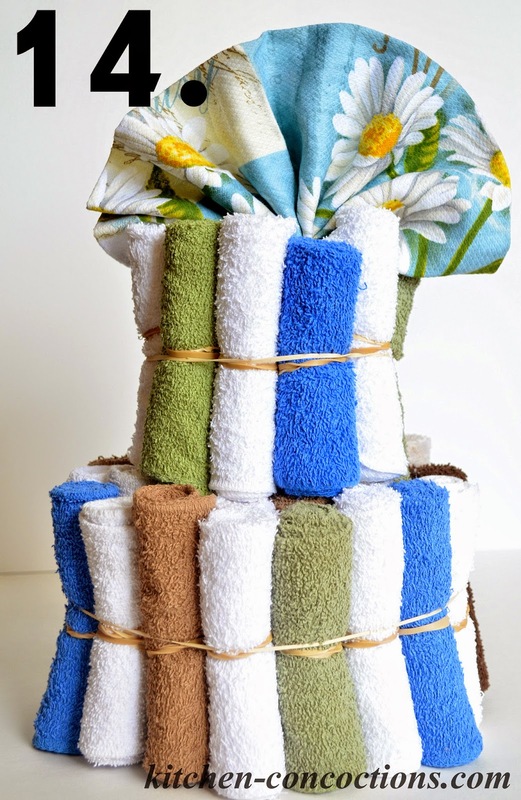 Wrap the folded towel around the middle of the bottom cake tier. 16. Using a safety pin or bobby pin, secure the towel, on both sides, at the back of the cake. 17. Repeat this process to wrap a decorative towel around the top tier of the cake. 18. Cut and tie ribbon into a bow around decorative towel for each cake tier. 19. Add desired cake toppers, inserting them into the top and sides of cake. 20. Cake is ready for gift giving or decorating a bridal shower or house warming party. Optional, completed cake maybe placed in a large round cake pan or on a pizza pan for easy transport.